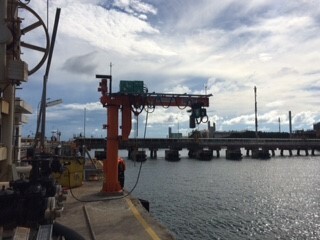 Rabutec was awarded a Purchase Order by Petronas Dagangan Berhad for Engineering, Procurement, Construction and Commissioning of a 1 Ton Slewing Jib Crane and associated works at their Labuan Fuel Terminal. All actual fabrication work was carried out in Kuala Lumpur. Major equipment namely motor & hoist and slew motor are explosion proof compliant. 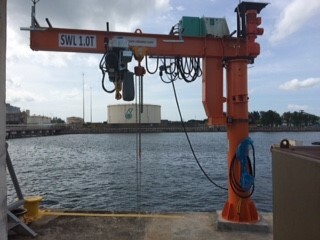 The crane structures were assembled and function tested at Rabutec yard in Klang prior shipment to Labuan. 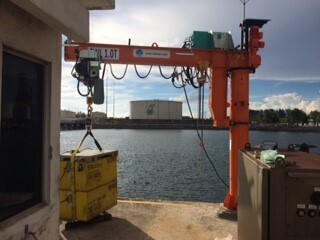 At site in Labuan, the crane was then assembled, installed and tested. Load Test of the crane was witnessed by JKKP and subsequently PMA certificate was issued to that effect.